Learn Why Purple is the Color to Go For this American Heart Month! Subject: Learn Why Purple is the Color to Go For this American Heart Month! February is American Heart Month and from hearts to dresses it’s all about red. But, do you know what goes great with this crimson color? Purple! Purple is a cue that fruits and veggies have natural plant nutrients called polyphenols that can help promote heart health. And, one delicious way to add the power of purple to your plate is with the mighty Concord grape. While this “super” fruit can be hard to find fresh, you can enjoy its taste and heart-health benefits with 100% grape juice. Each glass is made by squeezing whole Concord grapes — skins, seeds and all — and 20 years of research says it helps support a healthy heart. In fact, 100% grape juice delivers many of the same polyphenols and heart-health benefits as red wine, with no added sugar. 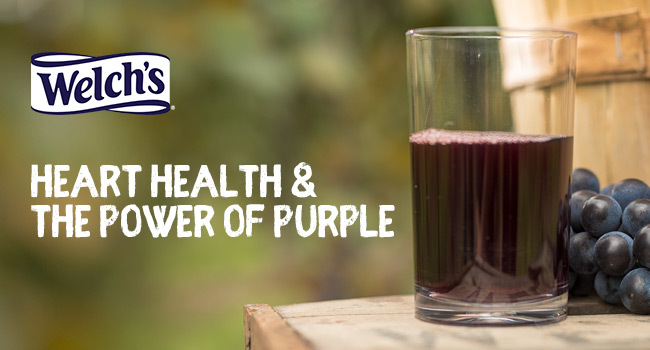 Want to learn more about 100% grape juice and the power of purple? Visit Welch’s new health professional website featuring educational tools, heart-healthy recipes, research and more. Check out the below for some of the highlights — they’ll have you thinking about purple for American Heart Month — and all year long! Don’t know an anthocyanin from a proanthocyanidin? Don’t be perplexed by polyphenols! Watch this webinar and learn from polyphenol expert Taylor Wallace, PhD and registered dietitian Alex Caspero as they share the latest research on these plant nutrients and advice on how to create deliciously heart-healthy dishes using purple foods and beverages. This activity is approved for 1 CPE credit. Heart Health Never Tasted So Good! 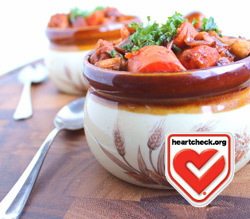 Looking to celebrate American Heart Month with a delicious dish sure to make your heart and taste buds happy? Look no further! We’ve collected 20 of our favorite heart-healthy recipes in one downloadable e‑book. All recipes are certified as heart healthy by the American Heart Association® via their Heart-Check Recipe Certification Program. Plus, they include 100% grape juice — so they taste grape‑tastic! Love the taste of 100% grape juice made with Concord grapes? Download this fact sheet for 8 more reasons why you should enjoy a glass of 100% grape juice, as well as creative and flavorful ways to add it to heart-healthy meals and snacks. 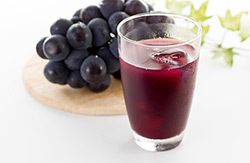 Visit welchs.com/health and grapescience.com for more on the super taste and super nutrition of 100% grape juice, and follow along with @WelchsRD on Twitter and Instagram for additional heart-health facts, tips and inspiration.